BAKERSFIELD, Calif. (KBAK/KBFX) -- Bakersfield congressman Kevin McCarthy is under attack in a newly released TV ad that claims the House Majority Whip favors undocumented immigrants over American workers. It's the latest salvo in the national debate over comprehensive immigration reform. The TV spot begins with a man's deep voice saying, "This is an SOS to Californians trying to find jobs! Save our state!" Images of a map of the Untied States with a flag super imposed on it and the initials "SOS" flash across the screen. 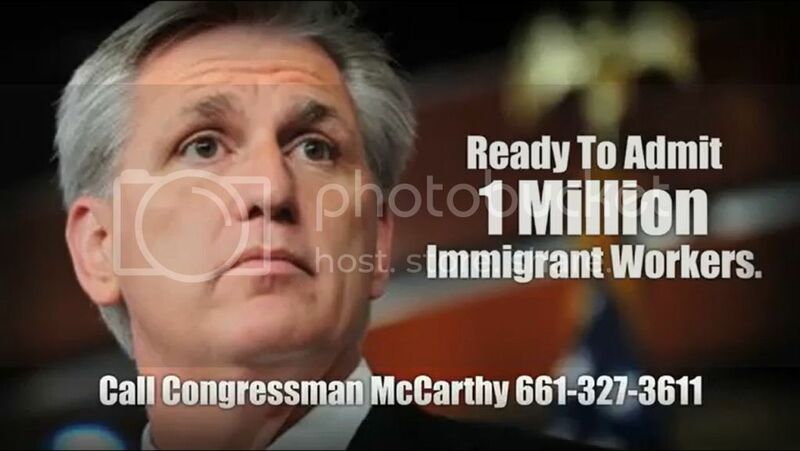 "Bakersfield congressman Kevin McCarthy wants to bring in more migrant workers to take jobs. He's even talking about legalizing 11 million illegal aliens making it easier for them to take jobs, too," says the announcer as McCarthy's image pops up on screen. The campaign is being waged by CAPS, Californians for Population Stabilization of Santa Barbara. CAPS describes itself as a group that "works to formulate and advance policies and programs designed to stabilize the population of California, the U.S. and the world at levels which will preserve the environment and a good quality of life for all." It vehemently opposes any proposed immigration reform that legalizes undocumented immigrants and grants them the right to legally work in this country. "We're concerned about population growth and its affects on quality of life for everybody," said Jo Wideman, executive director of CAPS. The goal is to pressure McCarthy into rejecting any bill that includes "amnesty" for the undocumented at a time of high unemployment said Wideman. McCarthy has already been under pressure from numerous other groups who support a pathway to citizenship for the estimated 11 million undocumented immigrants living in the country. On Wednesday, more than a thousand people descended and marched to McCarthy's office to ask that he support comprehensive immigration reform. Among those participating was Bakersfield mayor Harvey Hall. "Our future will be brighter if we engineer positive congressional immigration reform," said Hall as he addressed supporters. Political consultant Stan Harper believes the TV campaign by CAPS will not hurt McCarthy. "It's not going to affect him politically one way or another, because he's got the political base, he's got strong Republican registration, it's not going to affect him," said Harper. CAPS plans to keep the TV campaign running until Labor Day. Eyewitness News placed several calls and emails to McCarthy's office to get a comment on the TV ad campaign. His office did not respond.